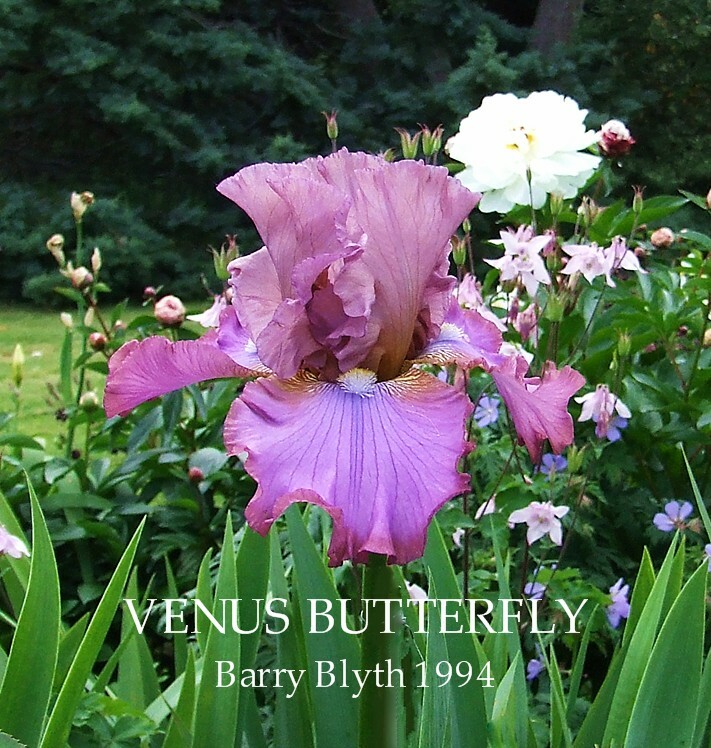 VENUS BUTTERFLY (Blyth, Aust. 1994) M-ML 38"a a mulberry lilac tan blend with the standards been lilac infused tan and the falls are more mulberry lilac and mauve around the beards. Tannish hafts and white beads tipped yellow in throat. Wide and horizontally cleared with good 3 to 4 way branching. Sweet fragrance. Strong grower. VENUS BUTTERFLY Barry Blyth, R. 1994 Sdlg. A63-6. TB, 38" (97 cm), ML ; S. mulberry lilac infused light tan; F. mulberry lilac, mauve near beards, tannish hafts; beards white, tipped yellow in throat; pronounced sweet fragrance.Dance Man X Rembrandt Magic . Tempo Two 1994/95. At home growing in a full sun position this woodland plant has become firmly established, blooming at it's best with a fantastic display signalling that Autumn is well a truly here!! 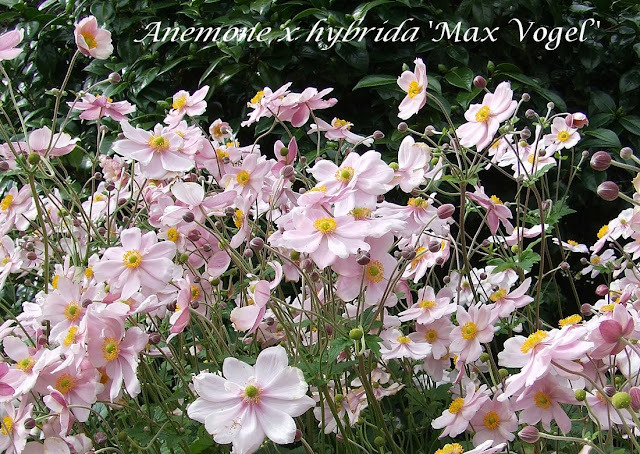 Commonly called the Japanese Anemone it is a hybrid between two species one being A.hupehensis, growing taller than the species 120cm-150cm.(48"-60"). The term Japanese anemone is misleading. A. hupehensis is actually a native of Hupeh province in Eastern China. Once established its super easy to grow. When researching Iris history there is always more to learn as I progress the purchasing or gain access to historical writings that may or may not contain articles of interest about 'The Iris'. I recently found this historically informative article, its author I have yet to identify but I thought it noteworthy for the colour description of irises named and the opening paragraph which is surprisingly current. The problem is I still haven't finished the writing of the original article which lead me to this information in the first place but I think you will agree it was a pleasant time out to have. THE GARDENERS CHRONICLE, Unknown Author, 15 June, 1878, Page 757. 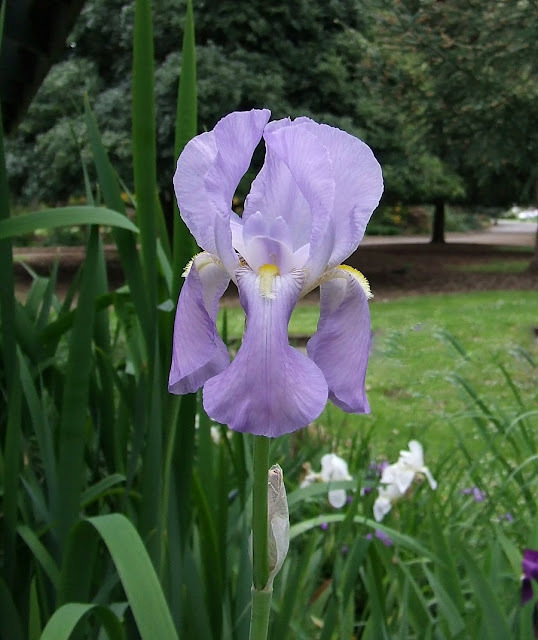 Why is it that the varieties of Iris germanica do not find a place in modern gardens? Indeed this question might be very reasonably put in regard to many other fine plants that have fallen out of cultivation to a great extent, just as if fashion—that fickle goddess ruled the horticultural as it does the social world. We have fashions in horticulture, and they are sometimes unjust to grand old plants that are well fitted to make a garden smile with the gladness of a beauty that is like a glimpse of heaven brought down to light our common soil. If any one would see in the German Iris the delicate and striking patches of colour they can be made to produce in our gardens, a visit should be paid to Mr. Robert Parker's nursery, at Tooting. There a collection of fifty to sixty varieties at least can be seen in full bloom—and such bloom, too—not a spike of flowers here and there, but almost countless spikes thick with flowers over canopying the leaves from among which they spring. There is an immense bed of these Irises in divisions some 3 feet in width, with blocks of a single variety 5 feet or so in length, forming panels of charming colours facing to the blue sky above. These beds of Iris have been planted out about three years, and this suggests the advisability of forming permanent plantations of these fine decorative subjects for service in the garden. Perhaps it would be best were the roots lifted, divided, and replanted once in three years. When well-established in good soil a rapid and spreading growth is made, and for the sake of keeping the plants in proper bounds periodical replanting's are to be commended. One great feature about the German Irises is their remarkably free and successional blooming character ; the earliest bloom by the third week in March, or the beginning of April, and yet some have not as yet shown colour, thus then- flowering time may be said to cover a space of three months at least. Then what an accommodating plant it is : it is one of the best of London plants, growing almost anywhere in the midst of the great Metropolis where there exists an apology for a garden, and flourishing as if no bounty it can bestow could be too large. It will grow in almost any soil and situation, but if 'any person' could imagine one eminently suited to its well-being it would be the light, generous sandy loam in which these plants do so well at Tooting. Some are dwarf, quite dwarf, not more than 18 inches in height; others reach a height of 2 and 3 feet ; and thus a double or treble line might adorn a bold shrubbery border. 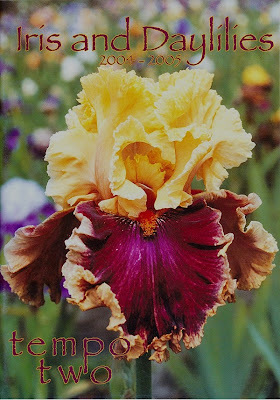 A ribbon line of Irises would be a new feature, and, if the individual plants were wide enough apart. Delphiniums, Phlox's, Pentstemons, Et cetera, might come in between them for the sake of variety, and to secure a succession of flower ; but whoever plants let him dig the soil deeply, and not scruple to add a little dung and some leaf-mould to it. As these plants are by no means expensive, they can be planted freely at a moderate cost, and here is a list of rather over a quarter of a hundred varieties that represent the cream of Mr. Parker's large collection ; —Abou Hassan, rich golden-yellow, very free ; Arnols, violet suffused with bronze, very fine ; Augustus, azure-blue and violet, very fine ; Bridesmaid, white suffused with lavender, very pretty ; Celeste, lavender with white centre ; Chenedolle, chrome-yellow and white ; Comte de St. Clair, pure white and purple ; Cytherée, lavender-blue and light purple, a most attractive variety ; Darius, chrome yellow and purplish lilac, very fine and free ; Duchesse de Nemours, creamy white, the lower petals beautiful purplish violet—in this charming variety there is amost pleasing contrast presented in these two parts of the flower ; Gazelle, deep lavender-blue mottled with while, very early and extremely pretty ; Hortense, primrose, pale sulphur and orange-yellow ; De Berge,chrome-yellow and rich crimson, line ; Fairy Queen, white and violet-purple, very line and striking ; Hugh Block, dark sulphur and bluish lilac ; Jacquesiana, reddish bronze, dark orange, and velvety crimson, very fine and distinct ; Jordæns, reddish lilac and white, distinct and fine ; Lady Jane, coppery red and reddish brown, distinct and good ; Paquit, light reddish purple and crimson, very fine and striking ; Queen of May, rosy lilac, primrose and white, very pretty; Minico, rich golden-yellow and crimson brown, fine colour and very dwarf ; Pallida and its varieties, Dalmatica and Speciosa, Spectabilis, reddish violet and velvety purple, very early ; Victorine, satiny white and purple, very good ; and Walner, deep shining lavender-blue and light purple, very fine and distinct. The colours appended to the foregoing varieties are intended to convey the idea of the prevailing colours, but there are many varying tints and handsome reticulations on the standards and falls, and especially on the latter, that cannot be set forth in a description. The margins to some on the falls are very rich and attractive. A good number of the varieties grown by Mr. Parker are seedlings of his own raising, and it has been found that they flower in two and three years from the time of being raised. 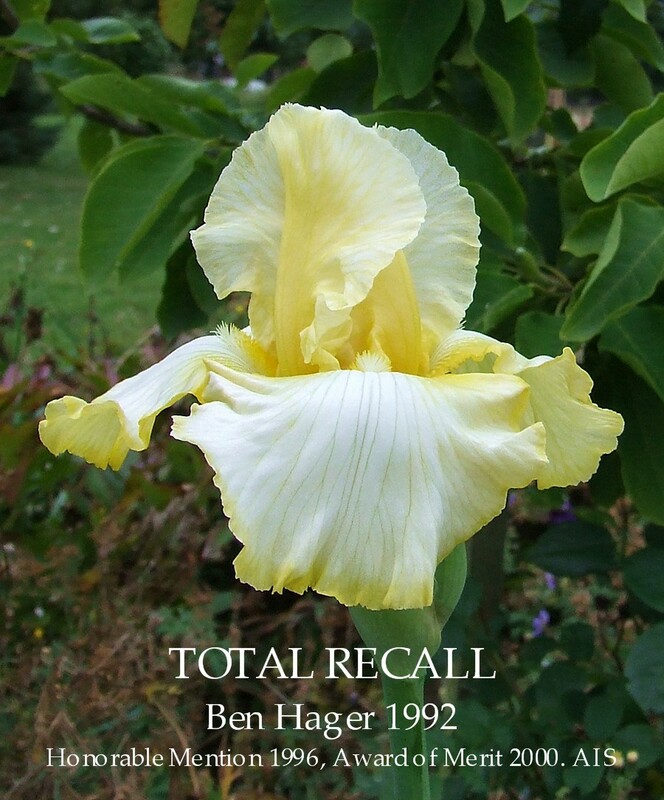 'Total Recall' re-blooming today, showing off its delicate colouring of soft yellow standards and pearly white semi-flaring falls that are edged with the soft yellow of the standards. Well branched, with strong bloom stalks, clean foliage, and has a great weed-like vigour, so can very quickly make an instant clump. Its a light primrose version of the yellow tall bearded iris 'Joyce Terry'. I can't for the life of me remember it blooming this past season but it grows among other irises of the same colouration, and it's more 'subtle' than 'standout' so in the regular season it just gets lost amongst the numbers so to speak. It's a cyclic re-bloomer, having two completely distinct cycles of bloom. After Spring flowering there is a second predictable bloom period. Obviously by blooming today it gets it's chance to standout and make sure you never miss it. Wide, Crystalline white falls bordered with a bright lemon trim. Near-white standards flushed lemon up the midrib. Yellow beards. Summer through to Fall re-bloom. HM '96; AM '00. 1. Iris history; 2. Cultivation; 3. Chromosomes; 4. Guide to identification; 5. Section Iris; 6. Section Psammiris; 7. Section Oncocyclus; 8. Section Regeli; 9. Section Hexapogon; 10. Section Pseudoregelia; 11. Section Lophiris; 12. Series Chinenses; 13. Series Vernae; 14. Series Ruthenicae; 15. Series Tripetalae; 16. Sibiricae; 17. Series Californicae; 18. Series Longipetalae; 19. Series Laevigatae; 20. Series Hexagonae; 21. Series Prismaticae; 22. Series Spuriae; 23. Series Foetidissimae; 24. Series Tenuifoliae; 25. Series Ensatae; 26. Series Syriacae; 27. Series Ungiculares; 28. Subgenus Nepalensis; 29. Subgenus Xiphium; 30. Subgenus Scorpiris; 31. Subgenus Hermodactyloides; 32. 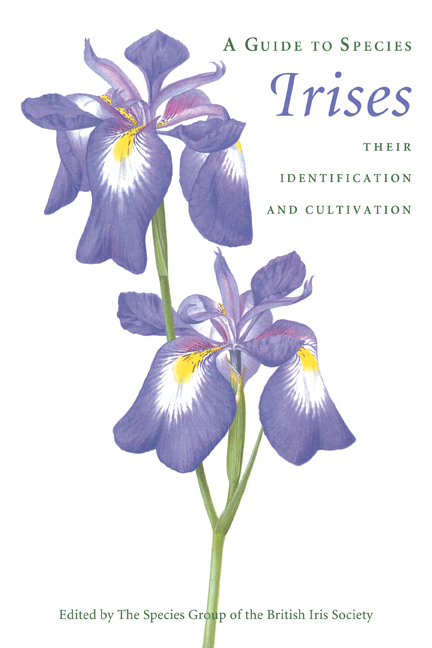 Iris pariensis; Distribution maps; Line drawings; Colour plates; Glossary; Index of species. Different? You Betcha! I could of joined the crowd and posted a catalogue shot of 'Decadence' but decided the above photo was a better selection as it accentuates the extraordinary ruffling and lace that have become the hallmark of this iris. Everything about it is extravagant from its bright apricot standards to the band of apricot around the rich red-purple falls that are enhanced with bright tangerine beards, very showy and an excellent parent. Grows with a robust vigour and high health in my garden. 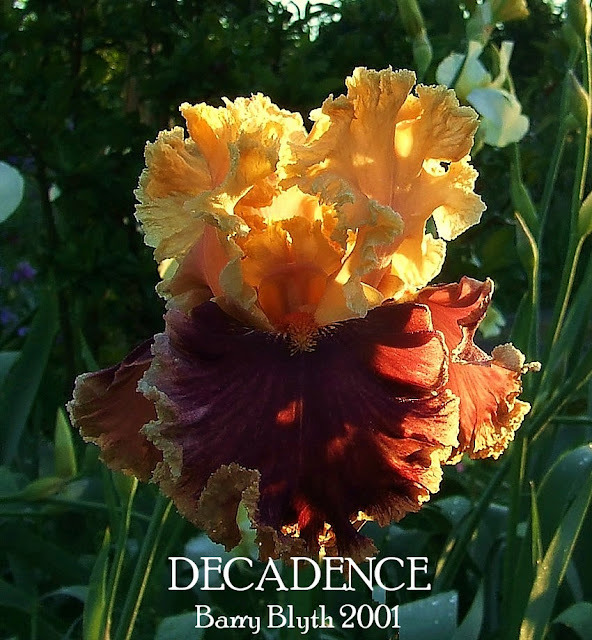 DECADENCE (Blyth 2004) is well-named, with a devilishly inviting combination of golden-apricot standards atop tapestry falls with varying degrees of depth in burgundy, wine, bronze, and mahogany, with edging the color of the standards, encapsulated in deep ruffles and lace. It held its own in cold, wet weather in both Oklahoma and Portland, retaining richness of color and with sufficient substance to keep itself together, when others in similar color combinations fell apart. DECADENCE (Barry Blyth, R. 2001) Sdlg. H83-G. TB, 38" (96 cm), M ; S. creamy apricot, faint rose midrib flush; style arms creamy apricot; F. light plum burgundy, 1/4" creamy apricot edge; beards tangerine; heavily ruffled and laced. Temple of Time X Louisa's Song. Keppel 2004, Tempo Two 2004/05. HM 2006,Walther Cup 2006, AM 2008, John C. Wister Memorial Medal 2010. Reports from America I've received are that 'Decadence' has a tendency to rot and blooms have trouble opening in some Northern and North Eastern States gardens where winter temperatures are harsh and it isn't unusual for ice to form around rhizomes which causes many problems, especially rot. There are also some reports that it also isn't at home in the hot/humid south. I would also note that I can find no comments explaining these potential problems by commercial growers that supply Rhizomes into these markets. Huge hat tip to Barry Blyth for having his great sense of adventure in Hybridising, the iris world is a much more brilliant and interesting place because of it. "Yes, it is a good-looking iris! Also unmistakably Shoop--or at least Shoop derived". Phil Edinger 2012. This imposing and colourful iris had me baffled for a while as the photo that accompanied the Iris when it was purchased differed somewhat to the iris when it bloomed at home. A search on the internet came up with zilch, and the only available catalogue descriptions were from Bay Blooms (NZ) Spring/Summer catalogue 1998 which merely stated "This variety has been much admired. All over cream with a pink influence throughout", and a earlier Jean Collins Iris Gardens (NZ) catalogue had telescoped the description to just, "Cream with a pink influence", so not a lot of information overload here. Now as we all know a official checklist description apparently trumps all, but when you ID iris that old adage "Trust but verify" definitely applies, so conformation that we were onto a winner has come from the catalogue and Bulletin advertisement descriptions sent from America, a helpful addition to the knowledge base and are copied below. At 45 years old its colouration is still very much 'today'. Like Jean Stevens, George Shoop was one of the great master's of inbreeding using a limited number of out crosses in his breeding programme. Blooming with a entrancing colour combination the plant has good vigour, and a iris that will continue to be much admired at home. GEORGE A. SHOOP, Hybridizer, Portland Oregon. 1967 Introductions. Gypsy Rings (Shoop 1967). EM. 36". A flaring, ruffled flower with pink standards and white falls with one-fourth inch yellow rim, and a pink-tangerine beard to add to its feminine charm. Well-branched. Fine grower. Gay Whisper X 59-6-1. Gypsy Rings (Shoop 1967) EM. 36" A charming flared and ruffled iris with pink standards and white falls that have an attractive, one-fourth inch border of yellow and a pink tangerine beard to add to its feminine charm. With its beauty, unusual color pattern and model growing habits it is easy to see why this iris is so well liked. Gypsy Rings (Shoop 1967). Pink standards flushed lemon along the ruffled edges and white falls with a wide yellow border all the way around; pinkish tangerine beards--and it all makes a really beautiful flower. BayBloom Nurseries, Cambridge Road, R.D.1 Tauranga. Spring and Summer Catalogue, 1998. GYPSY RINGS G. Shoop, Reg 1967 Sdlg. 63-18-1. TB, 36" (91 cm), E-M ; S pink; F white with 1/4" yellow rim; ruffled; pink-tangerine beard. Gay Whisper X 59-6-1. Shoop 1967. The grower I purchased this iris from is no longer in business so I cannot help as to where you can buy it. 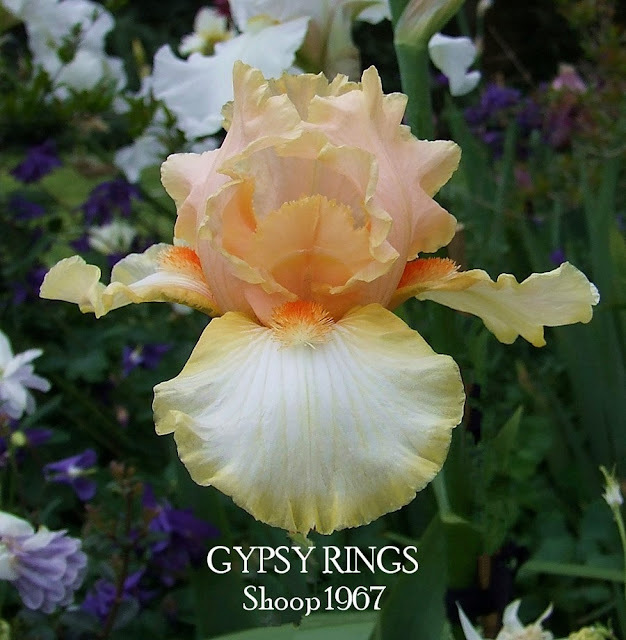 I have recently (yesterday) purchased another George Shoop 1960 vintage iris labelled 'Spanish Gift', reported to be a very bright apricot-orange coloured iris with a deep orange-red beard, hopefully another visual treat when it blooms so I'll keep you posted. Big hat tip to Phil Edinger for the initial catalogue research from America.